The Old Phoenix attracts people looking for quietness and nature. Whilst some may choose to only relax on the beach many visitors want to take advantage of the numerous walks and sightseeing spots in the area. Only a few minutes walk from the Old Phoenix, on the way to Loutro, you can stroll on the peninsula. 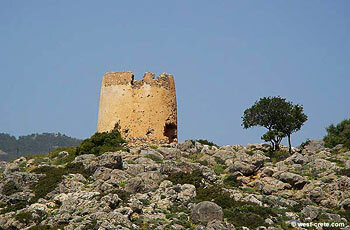 There is a ruined Turkish castle and windmill as well as many Roman ruins. It has a very special atmosphere, particularly at sunset time. On the other side of the peninsula is the small village of Loutro. A good place to go if you happen to find our place too quiet! Loutro has a few good restaurants, some bars and a couple of grocery shops. Walking about half an hour towards the West of Finix is the small beach of Marmara. It has become well-known for its beautiful water. You can also rent a canoe and paddle to Marmara from the hotel (it's a little under 1.5km). If you follow the coast you will be able to watch many birds (crag martins, rock doves, kingfishers) nesting in caves by the sea. Marmara is also the point where the gorge of Aradena ends at the sea. You can also walk up to the village of Livaniana, situated a good half-hour's walk from Finix. It is built on a ridge which separates the gorge of Aradena from the bay of Finix. The views are superb and you will probably be able to watch griffin vultures circling above. 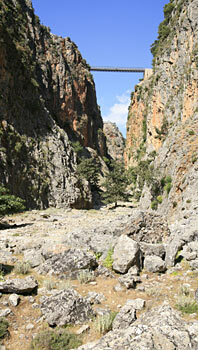 The gorge of Aradena is well worth a visit. Much quieter than the gorge of Samaria it is almost as spectacular. You will need good shoes as well as some sure-footedness to negotiate some of the passages. It is easier to walk up than down (because some steep passages require far more concentration and sure-footedness going down) and you will need around 3 hours to reach the picturesque abandoned village of Aradena. A word of warning: do not walk in the gorge if it is raining (or has recently rained), there is a high risk of rocks falling. Likewise, avoid walking below a cliff if you see or hear goats in it: they often dislodge stones. Once in the village of Aradena you can either walk back down through the gorge or walk half an hour to Anopolis (on the road). A dirt road leads up from the village square towards a chapel that you can see on top of a ridge (there is also a sign painted on a wall saying: Loutro no cars). Follow the dirt road 15 minutes to its end. You will have a bird's eye view from Loutro and the coast, about 600 meters below: a stunning panorama. It is worth walking up to the chapel of Agia Ekaterini where the view is even better. From the end of the dirt road a path leads down to Loutro and Finix (it branches out much further down and is marked). The walk down takes at least an hour and can be quite tiring on the knees. The coastal walk to or from Agia Roumeli is also well worth the effort. You can either take a morning ferry from Loutro to Agia Roumeli and walk back or walk to Agia Roumeli and take the ferry back to Loutro in the evening. The walk (one-way) takes about 5 hours. This is a coastal walk which passes through a lovely pine forest (but beware there is also a long stretch with hardly any shade). A stop at the mostly deserted beach of Agios Pavlos is a must (you can also get water and food at a small canteen there). 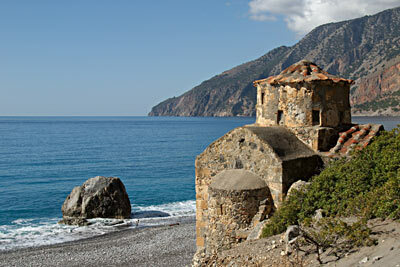 The chapel of Agios Pavlos (11th century) on the beach is also worth seeing. Agia Roumeli is also worth a visit even though it can be far too crowded in the afternoon when the hordes walking through the gorge of Samaria have arrived. Agia Roumeli has a nice beach (very quiet if you go a little to the East of the village) and a ruined Turkish fort above the village offering lovely views. You can also walk up the gorge of Samaria (or a part of it) although you are likely to meet sizeable crowds of walkers going the other way. Walking towards the East, through Loutro and another good hour along and above the coast you reach the beach of Glyka Nera (Sweet Water). Its name derives from the fact that if you dig a little in the fine pebble sweet water will seep through to the surface. The beach is generally very peaceful and the location, below high cliffs, is stunning. 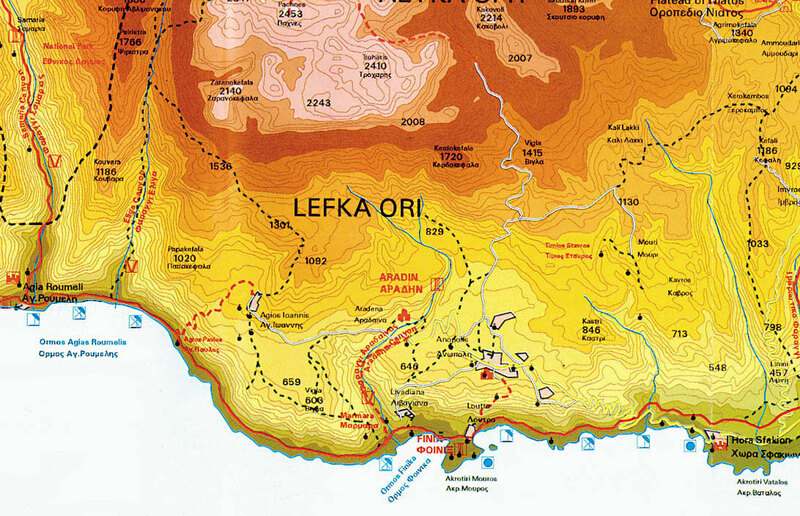 If you do not want to return on foot you can walk onwards to Sfakia (under an hour) and take a boat back to Loutro. There is also a regular boat connection (morning and afternoon) that connects Sweet Water beach to Loutro and Hora Sfakion. Dedicated hikers can also go further afield, especially in the mountains but this goes beyond the scope of this web site.